China launched a Long March rocket Monday with a high-resolution civil mapping satellite to survey natural resources and a craft to relay marine tracking data for U.S.-based Orbcomm Inc. The Long March 4B launcher lifted off at 0317 GMT Monday (10:17 p.m. EST Sunday) from the Taiyuan space center in Shanxi province, according to the state-run Xinhua news agency. It was 11:17 a.m. Beijing time. 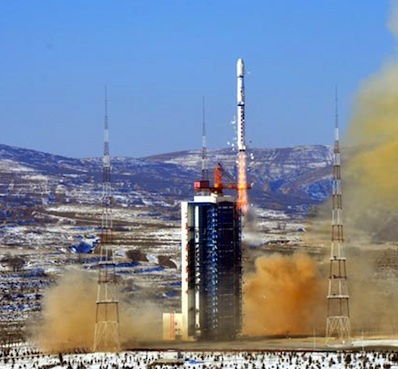 The 15-story rocket and the Ziyuan 3 satellite achieved orbit about 12 minutes later. The rocket's upper stage injected the craft into an orbit more than 300 miles high with an inclination of 97.5 degrees. Developed and built by the China Academy of Space Technology, the 5,842-pound satellite carries an electro-optical imaging payload comprising three pointing forward, down and aft. The ground-facing camera has a resolution of 2.5 meters, or 8.2 feet. Ziyuan 3 also features an infrared spectrometer. The satellite is devoted to civil applications, according to Xinhua. he rocket also orbited VesselSat 2, a 63-pound satellite designed to relay positions of ships around the world. Constructed by LuxSpace of Luxembourg, the spacecraft's services will supplement Orbcomm's next-generation communications satellites due to begin launching this year. Monday's mission was the first space launch worldwide in 2012.